How to survive a magic show? This was the most amazing way to spend 2 hours and 3800JPY. I mean “amazing” because I was amazed at the level of the magic show provided. 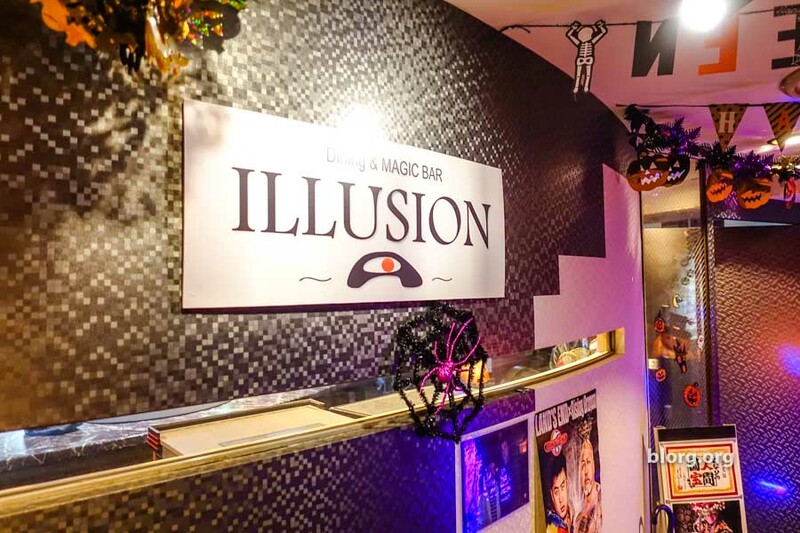 Only open for 2 nightly shows at 20:00 and 22:00 off the main street of Dotonbori in Osaka, you can find the magical bar “ILLUSION.” They have a pretty good selection of beverages and you can mix and match the menu for their all-you-can drink course. For only 3800JPY, you’ll get a magic show and 2 hours of drinking. ILLUSION is located on the 10th floor. We made our way up the elevator and as the elevator doors opened, we were in the shop and immediately greeted. This caught me off guard since I like to look around first to see if a place is worth going into. They were very friendly and immediately showed us to the seats before we could make a decision (I’m glad they did this) since the show had just started. We sat down and accepted the magical ride we were about to be taken on. The show was completely in Japanese, but you don’t need to understand Japanese to understand magic! The show was a thrilling 1 hour with several magicians taking the stage. Each magician specializing in a different type of illusion from fire, balance, sleight of hand other things I couldn’t understand. I’m not going to explain too much because you need to see it to believe it. Even if you don’t like magic, 2 hours just for the drink service is worth the price. Food is also available, but since Dotonbori is full of high quality food, we were already at capacity. As for the all-you-can drink service that was provided, the drinks were fast and strong! These were full on drinks each time. Not watered down and in a tiny glass. The drinks were served quickly and strangely enough, by the magicians. I haven’t seen that before. The all-you-can-drink package included any of the drinks on the menu. Food could be purchased at an additional cost. It was strange seeing magicians that had just performed on stage switch over to serving drinks right after the show. Since the all-you-can drink with show set was 2 hours, we still had an hour to drink after the show. While enjoying drinks at the table after the show, one of the magicians came by and sat at the table. He started doing close up magic for 20 minutes which completely blew my mind. Then, a different magician came by and did 20 minutes of a different type of close up magic! That was actually more fun since it was very engaging getting to be a part of the trick. For the price and experience, visiting this place is an absolute must while you’re in Osaka. Even if you don’t speak any Japanese, you can get by at this place. Pingback: Narita Airport To Downtown Osaka | StudHouse - интернет-агенство помощи студентам!